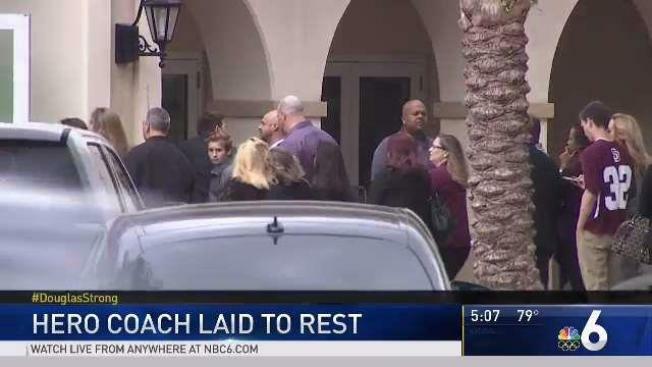 In front of over 1,000 people inside one of South Florida's largest churches, a mixture of laugther, cheers and motivation was present at the funeral for the Marjory Stoneman Douglas High School football coach described as a hero for his actions to protect students during last Wednesday's mass shooting. Family and friends, including Broward County Sheriff Scott Israel, gave their memories of Aaron Feis during the ceremony inside of Church by the Glades in Coral Springs Thursday. "He always put students and co-workers (first) and let them know he mattered to them," said one of his brothers, Michael, who was joined by another brother Ray, sister Johanna and father Louis. "All because that's Aaron." Louis Feis read a letter sent from a woman in Washington who wrote him following the tragic events, praising the bravery of his son. The 37-year-old, who graduated from Stoneman Douglas in 1999, worked school security and coached since 2002, working mainly with the Eagles’ junior varsity team. "Aaron Feis has been a hero to many people for a long time," said Mike Virden, a one time head coach at Douglas who worked closely with Feis. "The beauty of today, and the beauty of February 14th, is that the whole world gets to know that now." Witnesses of the shooting say Feis shielded students with his body as alleged gunman Nikolas Cruz opened fire inside the Parkland school. Feis was one of 17 people killed during the school massacre, one of the deadliest in United States history. "This world lost an incredible, incredible man," said Israel, who helped coach the Eagles along with Feis when his two sons played for the school. "Kids would do more for Feis than for others. Why? Because they didn't want to let Feis down." Israel described one of his sons calling shortly after the shooting to see if his former coach was okay. "If anyone knew Feis, before you even heard how he died, you knew he died putting himself in harm's way to save others," Israel said. "That's who he was." His grandfather, Raymond Feis of West Islip, New York, said earlier this week that his grandson "was wonderful." Feis lived with his grandparent for about 10 years as a child. He lived in nearby Coral Springs with his wife and daughter. "He always wanted to come back to New York because he grew up here," said Feis. "And he would come here with his 8-year-old daughter. And they were supposed to come up again now. It's horrific." Feis responded to the original call on a school walkie-talkie. Someone on the radio asked if loud sounds they heard were firecrackers, said football coach Willis May, who also carries a radio. "Every step he took in those halls, every turn he took in his golf cart and every tire mark he left on that field, he gave it with honor," family friend Brandon Corona said.